In September of 1995 I stuffed everything I could carry into a backpack and set off on a round-the-world journey, returning to San Francisco seven months later with a large Ziploc filled with pictures (nobody had digital cameras in those days) and a detailed journal of my travels. After some adjustment, I went back to work as a software engineer in the summer of 1996. Those were still the early days of the Internet -- long before the first blog or social media site appeared. 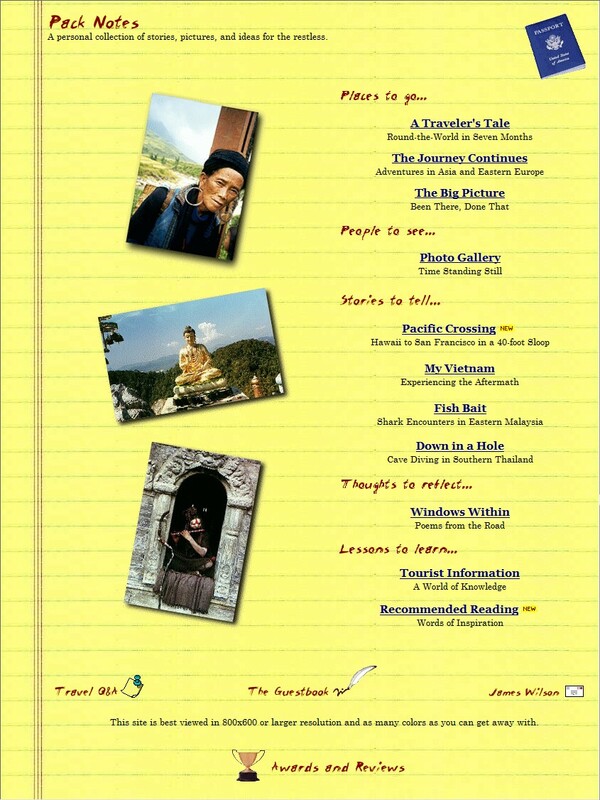 There were a handful of travel sites out there disseminating information to would-be backpackers and travel junkies like myself but, for the most part, on-line travelogues were a novel concept. If you wanted to publish your stories on a personal website at that time you needed more than just content -- it required some basic HTML programming skills as well. As a programmer with an interest in web development this seemed like a perfect opportunity to jump in. I spent several weeks scanning my 35mm photos to digital images, transferring my journals to text files, and building out HTML web pages. The result was "Pack Notes - A Traveler's Tale" which I published online in late 1996. A couple years later I took off on another adventure, this time for three months and continued to expand the website with tales from that trip. The site was generally well-received, garnering a number of web awards and reviews, including a printed appearance in the New York Times travel section (Feb, 1998). I also received a lot of comments and email, (mostly positive, some negative) from those with an interest in travel. Overall, it was a great experience -- a chance to share stories with other restless wanderers, pass information on to the resolute planners, and perhaps inspire a few of the gypsy dreamers. Ten years later, as the age of the travel blog evolved and interest in outdated travelogues faded I finally pulled the plug on Pack Notes. But, instead of relegating those tales to a dusty hard drive I decided to convert the website to a PDF and print a few books that I could share with family and friends. And, for those curious few who stumble across this page with an interest in travel or simply have a lot of time to kill, I've included a link to that file here.